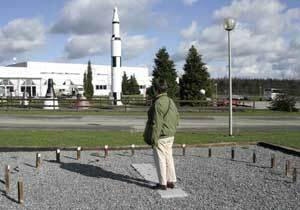 No, this is not my sundial, although I do like the Saturn 5. That will be my next project. 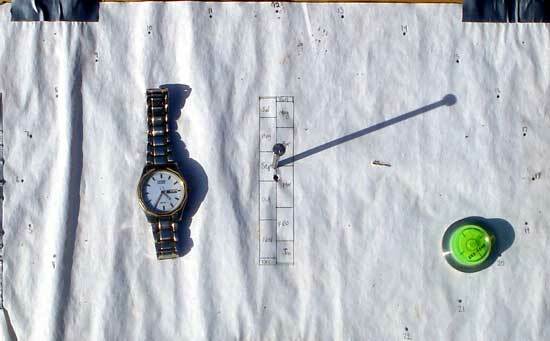 Most analemmatic sundials are designed for a person to act as the gnomon (the object that casts the shadow.) My wife, though, thought some large scale project in the back yard, in my hands, would turn into a gigantic, tacky mess. So, I had to settle for a slightly reduced version. It had to be a size that my wife could not actually see at all. So, I thought something about the size of an ordinary sheet of paper would be about right. Using my Smithlabs handy-dandy designer (see link above), I came up with this somewhat ragged prototype. This photo was taken in April with daylight savings time in effect. The clock shows a little after 15:30, one hour behind the watch, because of daylight savings time. The clock could very well be designed to show the correct time during DST months, since these months are the only time you would probably ever use the clock. 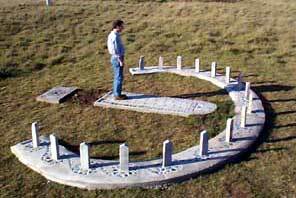 My next goal is to make a nice, permanent sundial that is small enough to not annoy my wife.